Within you will find twelve magical special properties for both armor and shields that can be added to your game with incredible ease. Also includes the new spell pilot shell. This product is everything it says it is. It presents us with a dozen armor and shield properties, oh, and a spell; a spell that is used for one of the properties. I really liked most of these special abilities (especially deeds and energy backlash) and found them quite useful. There were a couple with some flaws (the helpful ability is way too cheap, a +1 bonus would be fair for this, and the athletic ability should list what type of bonus it gives to speed, probably an enhancement bonus). There were a couple that were poorly written and confused me, like the runic and anathema ability (I know the gist of what they do, but I am still unsure of a couple of things). However, the rest were really cool and I am absolutely going to use some of these in my own games. The layout is a simple two column layout with a few illustrations (that I could easily have done without). As I read the pdf, I found myself noticing a couple of minor mistakes (sometimes the author writes CL and at other times he writes caster level, also, minor is not used about aura, it is called faint), but really, these were just minor mistakes and nothing that disturbed my understanding of the material. For the low price, this is a nice product that I would recommend to players. I am going to settle with a 3.5 verdict, rounded up for the purpose of this format. 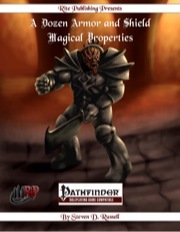 Tightly wriiten and extremely useful, this .pdf is a must have for GMs and Players alike. Everything is well priced (well apart from the Helpful Armour... I think that's a little too cheap, but that's not a major issue) and balanced for low-mid level gameplay. The Pilots property is the only one that is geared for higher level play (with a +4 enhancement price) but with +1-2 on all of the others I'm sure that they'll all see play in many games. There are a few items that I think a little more clarification would have been helpful with (Deeds and Damage-Absorbing), but not to the point where it would tarnish what is an excellent product. This is a ridiculously cheap product, I figured if I could pull one decent concept out of here it was a win. There are some items I wouldn't use in my game but at least half of the items are things I can see adding to my campaign at one point or another. The artwork is good if a little vanilla but appropriate for the subject and not distracting. The cover in particular I like. If you are looking to some new armor perks this is a solid product and amazing for the price. I'm not sure I agree with the pricing on the "Helpful" armor, seems like one of those additions which everyone would add. The other minor issue is the "Athletic" armor does not use a named bonus so it the speed would apparently stack with other items. The layout and design is great; the font is very legible and just the right size. Once again, another Rite product without a typo in sight! This supplement is short and does exactly what it says on the tin: provides a dozen armour and shield magical properties. Well, a baker's dozen, as it also has a spell at the end, Pilot Shell. 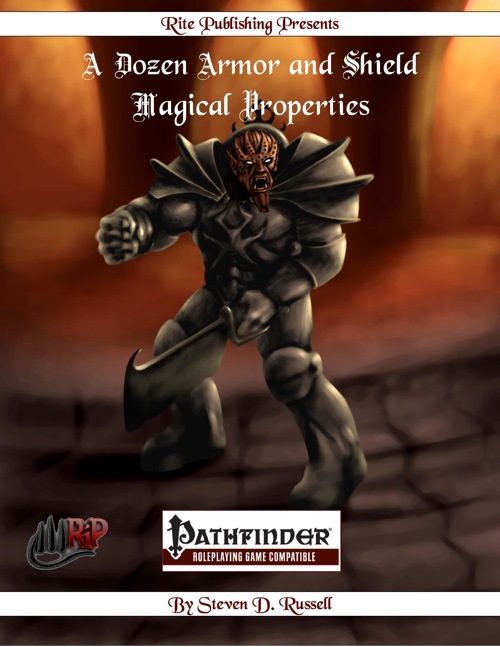 Though it looks like the spell was put in there expressly for the Pilots property, I can see how it may come in handy if the party will be up against golems. The Damage-Absorbing property reminds me a bit of a house rule that I've used since time out of mind which I call Shields Will Be Shattered. Basically, I let any player with a shield designate any one melee or force hit to be absorbed by the shield. The player takes no damage for that attack, but the shield is destroyed in the process. I like the Tactical property a lot, too. It reminds me of the Dodge Bonus alternate rule in Green Ronin's Advanced Gamemaster's Manual, which I actually wanted to incorporate into my current campaign but totally forgot about and will try in my next one. Overall, all of the properties are interesting/neat, though I would say they are best suited for a character of at least 7th level or they will unbalance fighting quite a bit. I wanted to thank both flash_cxxi and 0gre for taking the time to do in depth reviews of our product.